Get £25 off and two FREE pillows on your order at Otty with this exclusive promotional discount voucher code. Otty proudly present this promo code to all TroopScout users: serving members, ex-forces, family and friends. Click ‘Get Code’ to get the voucher code and open the Otty website. Add your chosen mattress (single mattresses not included in discount) and two pillows to your cart. When you have finished shopping, click on the trolley icon in the top right corner. Click ‘View and edit cart’ in the drop down box. Under the summary on the right hand side, click ‘Apply discount code’ and fill in the unique TroopScout promotional code in the box provided. Click ‘Apply discount’. Once your discount has been applied, click ‘Proceed to checkout’ on the right. Fill in the shipping details, select your delivery preference and payment method. You can pay via Paypal, American Express, Mastercard or Visa. Click ‘Place order’ to finish. Enjoy sleeping for the rest of your life! 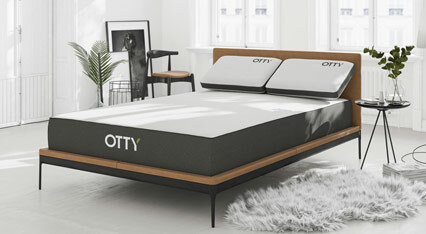 Otty has created its very own affordable yet premium quality mattress focussed on comfort, support and temperature control, and it’s designed and engineered right here in the UK. High quality Cool Blue Gel memory foam, comfort capsule springs and clever airflow technology come together to make the Otty mattress, and it’s hypo-allergenic too. Otty is so committed to making sure that every customer is a happy one, that they offer you the chance to try the mattress out for 100 nights. In the unlikely event that it’s not for you, Otty will collect it back from you and refund you in full- hassle free. Not only that, it’s also covered by a 10 year guarantee so don’t fret if there’s a problem after the trial. It’s so easy to assemble too; simply pull out the compressed mattress from its box in your bedroom, and let it unfurl and re-inflate. All that’s left to do is to jump in! You could even get a matching specially developed bed for your pet dog, because your dog deserves a good rest too. Order your Otty mattress today, and receive it the very next day, for free! That’s right, they offer free next day delivery as standard. What’s not to like? This discount only works when you add a matress (exclusding the single matress) and two pillows to your cart.